Good Shepherd welcomes Fr. Gary Wilde. Fr. Wilde previously served as rector at St. John’s, Moultrie, Georgia and as associate priest at St. Mary’s, Bonita Springs. 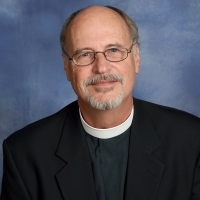 Gary spent his early adulthood in Chicago as a Methodist pastor, serving churches in the inner city and suburbs before entering religious publishing with David C. Cook/Scripture Press in 1985. He then enjoyed a 20-year career of book writing on contract for the major Christian publishers while also teaching classes in comparative religion at Elgin Community College in Elgin, Illinois. He is best known for his Bible Promises series of books and the Encouragers for Men series. Gary majored in New Testament Greek as an undergraduate, receiving the Wuest Memorial Prize for “Best Greek Student.” A graduate of Bethany Theological Seminary, Chicago, and Nashotah House Seminary in Wisconsin, he is also a Franciscan-trained spiritual director who entered the Episcopal priesthood in 2006. Gary is a teacher at heart, focuses on a ministry of encouragement, personal discipleship of men, warm pastoral care, and life-situation preaching.